Software providers: :Big Time Gaming, Blueprint Gaming, ELK Studios, Evolution Gaming, Leander Games, Merkur, Microgaming, NetEnt, Nextgen, Play’n GO, Red Tiger Gaming, Scientific Games, Stake Logic, Thunderkick and many more. Diamond 7 is a UK casino ideal for curious slot machine fanatics as a whopping amount of more than 40 game providers make up the casino’s selection of slots. It’s also a decent choice if you value a high level of security as the site is secured by the strongest SSL encryption available; guaranteeing that no one can snoop on your activities or tamper with your account. The navigation and user friendliness of the website is the biggest weakness of the casino and more or less the only one as there isn’t much else to complain about. Well, a part from cash outs that actually could be handled a bit faster to keep up with industry standards. 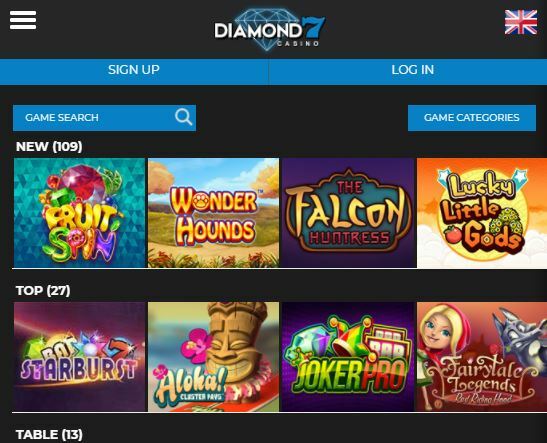 Continue reading the full review below and we’ll tell you more about the experience at Diamond 7, including bonus offers, game selection, customer service, payment methods and withdrawal times. 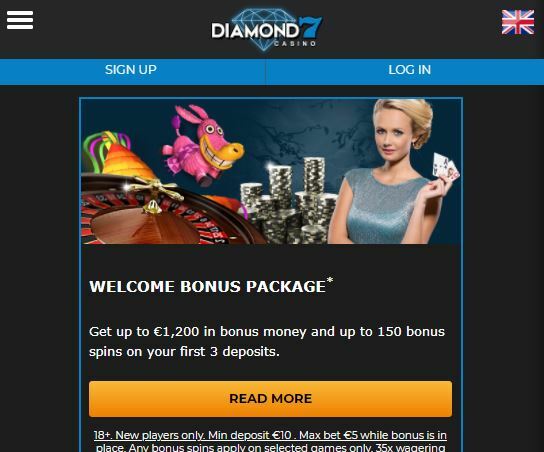 Being a player with Diamond 7 UK you can expect to get your hands on a fair deal of rewards. It’s far from the casino with the widest selection of bonus offers, but they do have a couple of promotions running every week, with many of them being matching deposit bonuses. 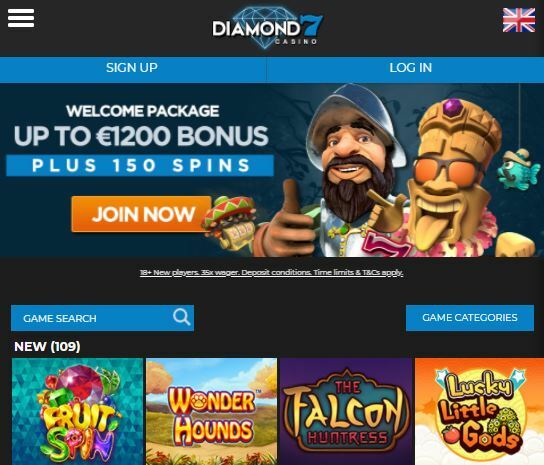 Should the bonuses at Diamond 7 still not meet your needs and you’ve deposited a fair amount of cash, there’s one more way to get a hold on some extra money or free spins. You can simply speak with the customer support on live chat and ask for a goodwill bonus. They won’t always be able to hand you one, but if lady luck hasn’t been on your side recently they are likely to help you out. As a high roller or frequently visiting player of the casino, you may also earn an entry into a VIP club and doing so you never have to worry about not being rewarded. In addition to receiving invitations to exciting events and getting exclusive bonus offers, you’re able to get up to a 20% cashback on all your wagers. 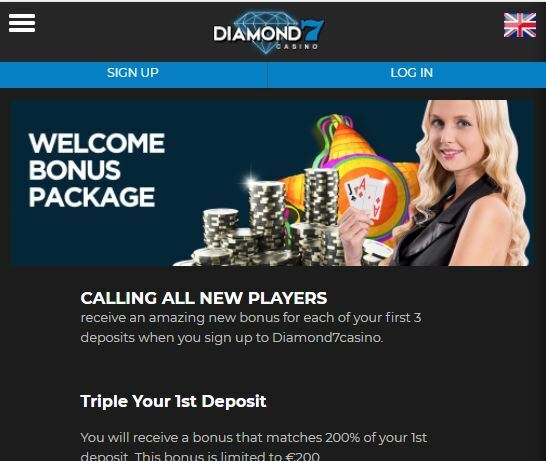 As with every casino, creating an account for the first time will also enable you to a welcome offer and with Diamond 7 this means getting a bonus on your first three deposits. Should you make the uttermost of the offer, you are able to get your hands on £500 extra to play with and a total of 50 free spins. The wagering requirement of the offer unfortunately isn’t one of the lower as the received bonus + deposited amount needs to be turned over 35 times, which is quite high. Having said this, it’s still a very valuable welcome bonus as you always play with your real money first and any winnings made from these can be cashed out at any time. Withdrawing winnings before the wagering requirement has been fulfilled will of course result in the received bonus money being forfeited, but this way you’re never fully committed to the turn over. In case you are winning big on your deposit you can always decide yourself if you’d like to cash out your winnings or keep playing for a chance to also have the bonus money turned into your own, which is a very valuable choice to have. As a table game enthusiast it is important to know that the Diamond 7 welcome bonus unfortunately can’t be wagered on any other games than slots and scratchcards. If there’s one thing making Diamond 7 UK stand out from many other online casinos, it’s their library of thrilling fun. It’s not that they have a record amount of games to brag about, but the fact that they offer videoslots, table games and scratchcards from more than 40 different game developers. This is quite amazing and perfect if you’re interested in trying out new games, particularly slots that you’ve never even heard about before. All in all it’s a great selection of games and with 600 slots, about 20 of them jackpot machines, you can spin the reels on many of the most popular releases and chase life changing winnings while exploring new ways of fun and discovering hidden gems. As a table game enthusiast you’ll also be very pleased. In addition to a lot of popular classics and lesser known games such as Red Dog, Six Shooter, Swap the Flop and Odd One In, a fantastic live casino is offered by Evolution Gaming. This means that Roulette, Blackjack, Baccarat, Three Card Poker, Casino Hold’em, Caribbean Stud and Dream Catcher can be enjoyed as a genuine casino experience with professional dealers serving you. The only real downside with the library of games at Diamond 7 Casino in UK is the lack of video pokers. Unfortunately this type of game isn’t offered at all at the moment. Navigating the Diamond 7 Casino creates quite a bit of mixed feelings. On the plus side it’s very easy to find everything that you need as menus are well structured, making bonuses, games and support quickly accessible at all times. With a stylistically pure design of white text over a blue background the visit is also quite pleasing for the eyes. There are a couple of banners running which are showcasing the biggest jackpots and latest winners, but it’s not in any way disturbing. For some players it’s probably appreciated. What’s causing the mixed feelings is partially that some information on the website seems outdated and partially that some navigational buttons aren’t working on PC. You’re supposed to being able to filter games by provider and search for a game of your choice, but it simply isn’t working. Therefore you’re forced to browse through a long list of games. Not only is this inconvenient, but it’s also quite laggy. Although no mobile app is currently available, the game navigation works a lot better on phones and tablets as you’re able to search and filter by several categories. However, this is unfortunately quite a laggy experience as well and all in all we’re left with an impression that not much care is put into the optimization of the casino. As a low stakes player it is good to know that the minimum amount you’re able to deposit is set to £20. Making a cash out with Diamond 7 is easy and shouldn’t ever be a problem. However, it’s important to know that a withdrawal isn’t processed until 48 hours after being requested. This means that you won’t ever experience any lightning fast cash outs. It’s not all too bad of a waiting period, but it isn’t very competitive with today’s industry standards either. Being a UK licensed casino you should also know that a verification process has to be done at some point, which may further delay one of your withdrawals. This means that you’re required to send a copy of an ID and a proof of address before your cash out can be handled, which is all part of anti-fraudulent laws that the casino has to follow. In contrast to the mediocre withdrawal times, the customer service at Diamond 7 Casino is quite a good one. If you love speaking in phone you may be disappointed as no support is offered through this medium, but other than that you should be more than satisfied. No matter the time or the day, a customer agent can be reached on either live chat or e-mail as the support is a 24/7 one. Not only that, but the representatives of the casino really seem to care about their jobs as they, in our experience, are very friendly and helpful. The biggest selling point of the Diamond 7 UK experience is the very wide variety of game providers offered. If you’re a videoslot enthusiast that love experimenting with new games, this casino could definitely be a great way to find new favorites and discover game developers you haven’t heard of before. The casino’s welcome bonus is also designed in a very advantageous way so grabbing this while exploring all of the thrilling fun is highly recommended. Other than this Diamond 7 has really nothing new to bring to the table. It is an overall decent casino experience with a 24/7 customer support, high level of security and a fair amount of bonus offers. It could have been a lot better if the website was better optimized as the lack of game navigation on desktop and the lag on both desktop and mobile devices can be a bit painful.